Heavy-duty type t fuses for critical circuit protection. Used for air conditioners, furnace blower Motors, swimming pool pumps, deep freezers or any circuit where Motors frequently turn on and off. Use for all commercial applications. The type t plug fuse is an industrial strength product. It provides superior protection, yet will not open under repeated motor startups. Available in a wide amp range to permit exact sizing for motor protection. These fuses thread into fuse receptacles. Two types of threaded fuses are available: Edison base (brass threads) and rejection base (porcelain threads). the two are not interchangeable. 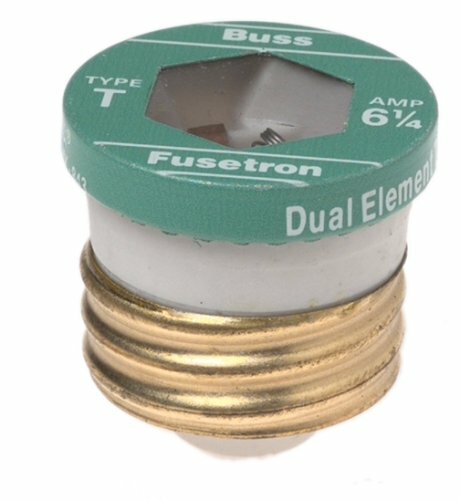 Two categories of plug fuses are available. The medium-duty fuses (tl or SL) have a time-delay feature for use on motor circuits. The heavy-duty fuses (t or s) are industrial strength products featuring the exclusive Cooper Bussmann dual-element construction. This spring loaded design provides superior short-circuit and overload protection. The t or s fuses have more time-delay than the medium-duty fuses in order to better protect Motors and critical residential circuits. Plug fuses are rated for a maximum of 125VAC. Tl and SL four pack (Pk4) versions priced per box. Plug fuses are often used in residential and industrial branch circuit and motor protection. Fuses are used to protect furnace blower Motors, pumps, power tools, garage door openers, etc. Motor protection fuses are usually used in conjunction with branch circuit protection. The fuse is often located in a box cover unit. Plug fuses provide a compact and inexpensive method to prevent damage to electrical Motors. They help reduce downtime and lower maintenance costs by opening the circuit when a dangerous overload is present. When used for residential branch circuit protection, fuses are typically located in the Main fuse panel.